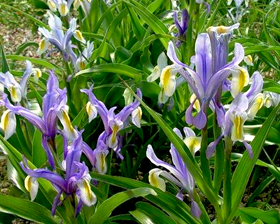 Very rare plant Iris vicar has shiny leaves and large white, blue-violey or flowers infused with pale blue. These are made in the axils of the leaves on 40cm tall stems. 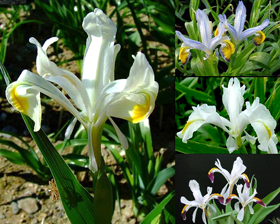 Propagated from plants first found in the Varzob gorge in Tadjikistan. A splendid Juno that does well outside, unprotected, in a well- drained, south-facing site in a loamy soil. Robust and it can in time make a good sized plant. 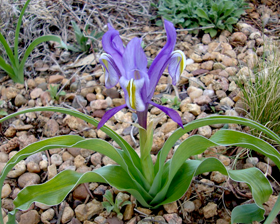 Iris vicaria seeds will usually germinate in 30-45 days. Sow Iris vicaria seeds about 6mm deep at about 15-20°C.Iris vicaria seeds will mostly germinate as the weather warms up in Spring, some may germinate during the Summer or Autumn but are more likely to stay dormant until the following Spring.